CHICAGO – The Lanes at Coffee Creek in suburban Tulsa, Okla., will host the 2018 revival of the Professional Bowlers Association Fall Swing Oct. 14-20. The PBA Fall Swing, which will award Wolf Open, Bear Open and Tulsa Open titles, will precede the U.S. Open which takes place Oct. 24-31 at Northrock Lanes in Wichita, Kan. The Fall Swing and the U.S. Open – the final major championship of 2018 – are both part of the 2018 Go Bowling! PBA Tour schedule. Defending champions from the last PBA Fall Swing, held at Thunderbowl Lanes in suburban Detroit in 2016, were Tom Daugherty of Riverview, Fla. (Wolf Open), EJ Tackett of Huntington, Ind. (Bear Open) and Sean Rash of Montgomery, Ill. (Detroit Open vs. this year’s re-named Tulsa Open). Following an official practice day on Oct. 14, the Fall Swing will get underway with two seven-game qualifying rounds on the PBA Wolf 33 oiling pattern on Monday and Tuesday, Oct. 15-16. 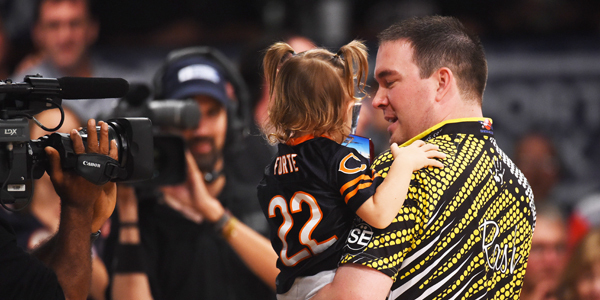 After 14 games, the top five will advance to the live Xtra Frame stepladder finals on Tuesday at 7:30 p.m. CT.
Wednesday and Thursday, all players will bowl two more seven-game qualifying rounds on the PBA Bear 39 pattern, with the top five bowling for the Bear Open title at 7:30 p.m.
Based on the combined 24-game qualifying totals on the 33-foot Wolf and 39-foot Bear oiling patterns, the top 18 players will advance to the Tulsa Open finals, a 18-game round robin match play event that will be contested on the Dragon 45 oiling pattern Friday and Saturday, Oct. 19-20. After a total of 42 games, including match play bonus pins, the top five will compete for the Tulsa Open title at 1 p.m. Central on a lane condition selected by the leading qualifier. All rounds of the Fall Swing will be covered live, exclusively on PBA’s Xtra Frame live streaming channel. For subscription information, visit xtraframe.tv.